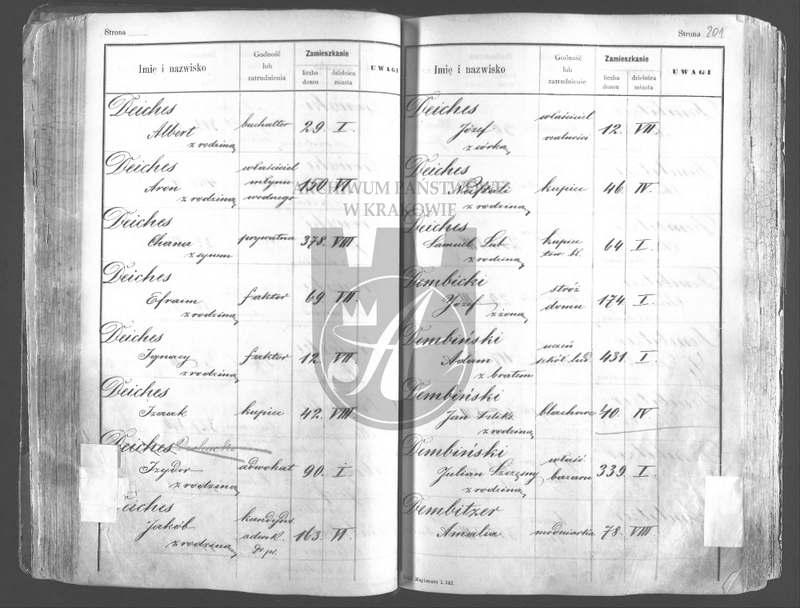 The Krakow Census of 1890 is now viewable online for free, with a (handwritten) name index, thanks to the Malopolska Digital Library and the Polish State Archive in Krakow. The purpose of this message is to explain how to find people by name in the census, using the index, and how to save census images to your computer. I will leave it to others to explain what the census fields mean and other details that will help you interpret the census images you find. Step 1: The census images are displayed online in the .DjVu file format, which your web browser (Internet Explorer, Firefox, Safari, etc.) probably cannot view by default. To view the images, you will need to install (once) a .DjVu plugin for your web browser. The plugin I use is available for free at www.caminova.net/en/downloads/download.aspx?id=1. Some Mac users have reported problems with this plugin, and might want to Google for other plugin options. If you have already installed a .DjVu plugin (e.g., to view images found here on genealogyindexer.org), you can skip this step. If, after following the instructions below, you find that the plugin does not work and you cannot see any census images, see the additional instructions in a separate post after the example images, below. Indeks do Spisu ludnosci Krakowa z r.1890, Litery A - M.
Indeks do Spisu ludnosci Krakowa z r.1890, Litery L - Z.
Indeks do Spisu ludnosci Krakowa z r.1890, Litery A - L ( obcy). Indeks do Spisu ludnosci Krakowa z r.1890, Litery M - Z ( obcy). These are the four parts of the name index, divided alphabetically in two groups. To the left of each is a blue book icon and an orange square icon. The icons are (blue) links to images of the name index and (orange) links to library catalog data about each item. To start looking at the name index, click on the blue icon next to one of the index parts that includes a surname you are researching. For example, I am researching DEICHES, so I click on the blue icon next to "Indeks do Spisu ludnosci Krakowa z r.1890, Litery A - M." Note that there is an error in the description of this item: the alphabetical range covered is actually A-K, not A-M.
An orange window may appear asking, "How to display content of this publication?" Make sure that the option "I have appropriate browser plugin (Let My browser handle publication's content)" is selected. Check the box marked "Remember my choice," and then click the "Show content" button. Another orange window may appear saying, "To view this document you will need DjVu browser plugin..." Check the box at the bottom marked "Don't show this message again," and click the "Browse publication" link below it. If your .DjVu plugin is working properly, you should see an image of a book cover, and, above it, a gray menu bar containing, among other things, a dropdown menu reading 1/X, where X is a number. For the part of the name index I opened looking for DEICHES, X=360, which means I am viewing image 1 out of 360 in this file. The images are roughly alphabetical, so guess where in the range 1-X the first letter of your surname will appear and change the dropdown menu to that number to jump to the image. For DEICHES, I guessed 100, but that took me to an image beginning with DATTELBAUM. Refine your guess and/or use the arrow buttons next to the dropdown menu to move forward or backward to the correct image. On image 102, I found 11 DEICHES entries. To the right of each name in the index are two columns under the bold heading of "Zamieszkanie." The column "liczba domu" contains a number (a house number), and the column "dzielnica miasta" contains a Roman numeral (indicating a district of Krakow). Write down both numbers for each name you want to find in the census. For example, for DEICHES Aron, the numbers are 150 (house number) and VI (district number). You might also find it helpful to write down the name, if you are researching many people. Remember that, for each surname, you will need to search two of the four parts of the name index (one with "(obcy)" at the end and one without). Step 3: Return to the link you might have bookmarked, mbc.malopolska.pl/dlibra/publication?id=71468&tab=3, which lists all the census images by group and, at the bottom, the four parts of the name index. Except for the name index items, each group has a title beginning "Spis ludnosci miasta Krakowa z r.1890," followed by something like "Dz. IV, nr 102 - 153, T.17." This example means that the group covers part of district IV, the house numbers 102-153. The census images have a few different appearances. Some look like spreadsheets, with handwritten names and other data. Some have no names, a large box on the left full of typed text and "Karta oznajmienia" written large near the top right. Some, less common, are small cards, with handwritten information about a single person. 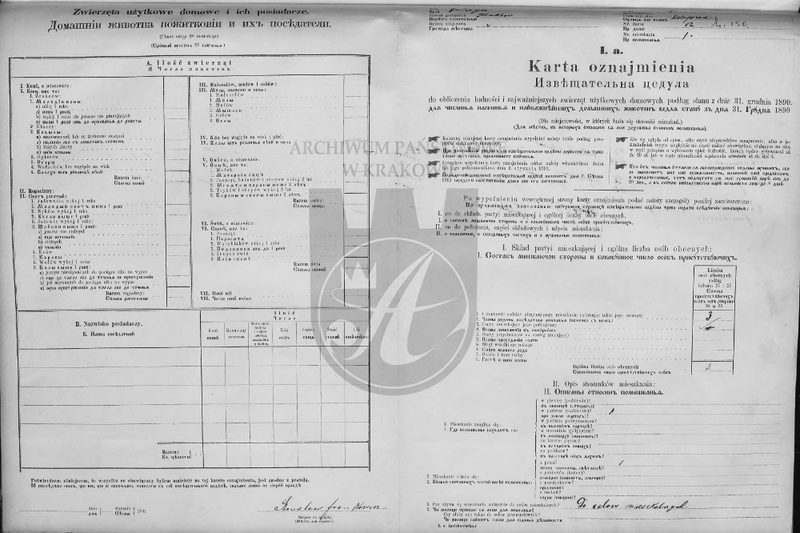 Frequently, the census images alternate between spreadsheets with handwritten names and the pages with "Karta oznajmienia." You are now going to focus on the pages with "Karta oznajmienia." Above "Karta oznajmienia" is a small form with handwritten entries. One of the fields, on the right side, two above "Karta oznajmienia," is "Nr. domu" and contains a handwritten house number (sometimes, more than one). Your goal is to find a "Karta oznajmienia" page where the handwritten house number matches the house number you wrote down. In my DEICHES Aron example, I am looking for house number 150, and the group of census images I opened covers houses 123-160. So, I guess that house number 150 will appear about 25% from the end of the group. This file has 612 images, so I use the dropdown menu to change 1/612 to 450/612. That happens to be a spreadsheet-type page, so I check 449/612 and find that it refers to house number 152. Now, I explore earlier images, always looking just at the "Karta oznajmienia" pages and just for the house number 150. In general, there are many Karta pages for each house number. Step 4: You will probably want to save the census images mentioning people you are researching. Above the image, on the gray menu bar, there is a disk icon at the left. Do not use that. If you click that, you will download all images in the group (in this case, 612 images). To download only the image you are viewing, move your mouse over the image and right click once. That will open a menu with a "File" section. In "File" is an option, "Save Page As," that you can use to save the single image to your computer in .DjVu format. You should be able to then view the image on your computer by clicking on the file, however that might not always work depending on the .DjVu plugin you have installed. So, I recommend testing this once before leaving the census image. If it works, go ahead and save any images this way. If it does not work, you can alternatively save the image in .bmp format. To do that, right click as above, and choose "Export to File" instead of "Save Page As." The disadvantage of saving in .bmp format is that the file takes up MUCH more space (~90 MB per image), since .DjVu uses compression. (You can, however, convert .bmp files to .jpeg, .png, etc., if you're familiar with how to do that.) Keep in mind that, if you want to share the images, some people might not be able to view .DjVu images. Step 5: What next? Hopefully, someone else will post an explanation of the meaning of the census fields and other details about the census images. I am sorry that I do not have the time to do this properly. I leave it to the Krakow and census experts. Please do not ask me what a particular census column means. If exploring this census has made you an expert, please post any information that might be of general interest. If you encountered a problem, please post it if it might be of general interest, especially if you also found a solution. Please do not ask me for help finding any individuals. Step 6? Enterprising Krakow researchers could possibly create an index mapping census images to house numbers, so we could create a list linking house numbers directly to census images. This would enable researchers to skip most of Step 3. Finally, I would like to dedicate this message to the memory of Stephanie Weiner z"l, a very kind, thoughtful, and energetic Krakow researcher. Had we not lost her recently, she would have been the first person I contacted about this discovery. Good luck, and please post if you have any major successes with this census. 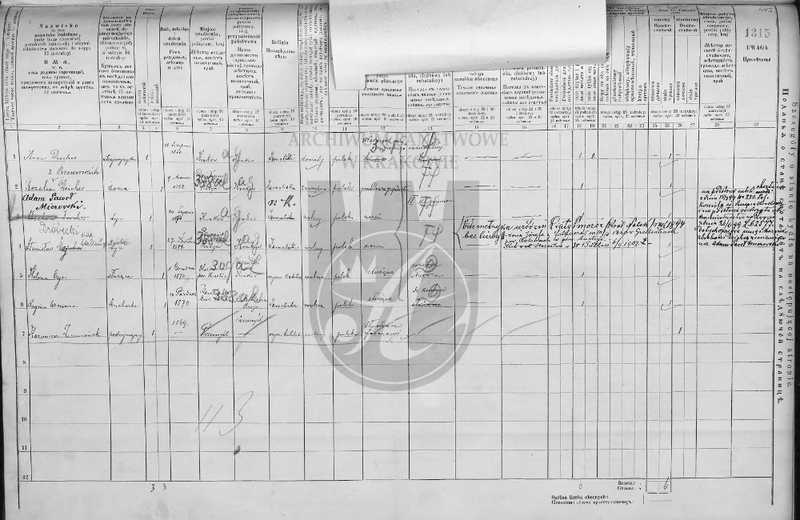 I am curious, but all credit naturally goes to the Malopolska Digital Library and the Polish State Archive in Krakow, which have yet again made an important contribution to genealogy. Instead of using a DjVu plugin to view the DjVu images, there is also an option to use a Java applet to view the images. Java is probably already installed on your computer, since it is used much more commonly by websites (and offline software), so you shouldn't have to download any new software (possibly, you will be prompted to update your version of Java). To view using the Java applet, click on the orange icon next to the item you're interested in at mbc.malopolska.pl/dlibra/publication?id=71468&tab=3. Then, if there is an option at the left called "Content presentation," click on that and you'll be asked to restore default settings, which you should do. That will cause the website to stop remembering that you previously said to always use the DjVu plugin. If there isn't a "Content presentation" option, no problem. Then, click on the "Content" link at the left. An orange window should open asking how to display the content. Instead of "I have appropriate browser plugin," click "DjVu built-in applet," then "Show content." On the next screen, "Browse Publication." Note that the Java applet does not (seem to) allow you to download the census images to your computer. Here's something to shorten your search. I went through both volumes of Indeks do Spisu ludności Krakowa z r.1890, i.e. Litery A - L ( obcy). and Litery M - Z ( obcy). and decided to capture the image locations per alphabetical listing. The index for "obcy" is not very useful in most cases. "Obcy" in Polish basically means stranger, thus someone not permanently living in Kraków at that time, in other words a visitor. If you are looking for your ancestors, what is more interesting is, of course, the list of the permanent residents rather than more or less coincidental aliens on a visit. True, some could have been related to your family but most often in a hardly relevant manner. It is worth noting that the census index is not strictly alphabetical. The first name in the F range starts with letters "Fa" the next with "Fl" the fourth with "Fr". Thus, you need to go through all the pages in F range if you are looking for a name starting with "Fa", who knows, it might be on the last page of the ranger or maybe even elsewhere? Actually, I found Feliks Glicksman Natan between the surnames starting with "F", even though most certainly Feliks was Mr. Glickman's first name and Natan his middle name. I guess, possibly the people putting together the index didn't care about or didn't know the alphabetic order well. What I can contribute with is the range of pages for the surnames starting with E, F,G, in the 1880 census. In general the index is very sloppy, I know, it is a bit late to complain but still. Regarding the meaning of "obcy" and the comment by user espintl above that "obcy" refers to "someone not permanently living in Krakow at that time, in other words a visitor," I am not sure that is how we should interpret "obcy." In Galicia, it was possible to be an official member of one community but live in another, and that might be what "obcy" refers to. Community membership was different than residency, and it can be found explicitly stated in the column "prawo swojszczyzny (przynaleznosc)." Also, as was pointed out by Fay Bussgang elsewhere, the "obcy" section of the Krakow censuses might include certain geographic areas -- in 1857 (though not later), for example, it apparently included Kazimierz. Whether this practice continued for other geographic areas into the online 1880-1910 censuses, I do not know.